Description: The Venetian Picot Mount is a vintage design that was popular in Macrame projects from the early 1900's. 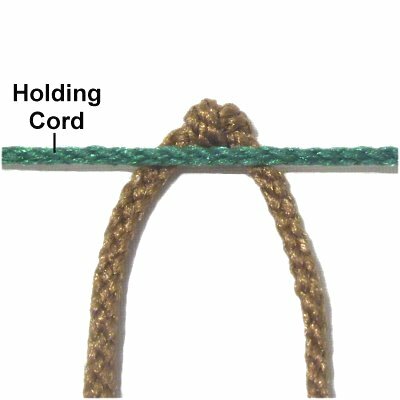 A picot is a knot or loop that stands above the level of a holding cord, ring, or dowel (when upright). The purpose for this technique is to add decoration along the top of an item like a curtain or wall hanging. 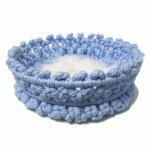 The Vintage Basket features the Venetian Picot Mount along the top edge. Description: This is the standard Venetian Picot Mount design found in vintage Macrame books. You can use it with material 2mm to 6mm thick. 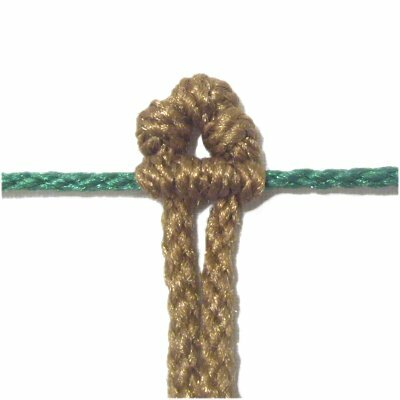 Preparation: To practice, you need one working cord and one holding cord to practice this technique. They should be at least 15 inches long. Step 1: Make a loop at the center of the working cord, crossing right over left. 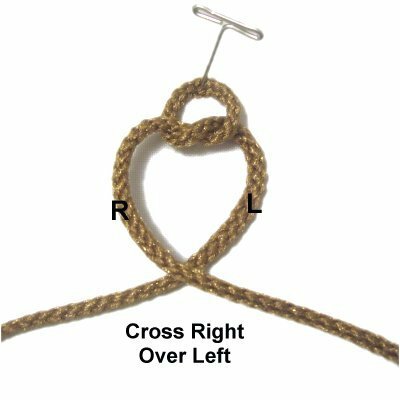 Step 2: Complete the Overhand knot by moving the right half of the cord under - over the left half. When using 4mm to 6mm material, tighten firmly. For finer material (2mm - 3mm), tighten more loosely so it's not too small. Step 3: Secure the holding cord horizontally on your board. Place the Overhand knot next to it, with the cords underneath it. 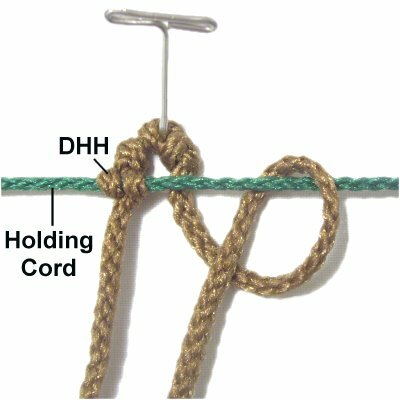 Step 4: Attach both halves of the working cord to the holding cord with Double Half Hitches (DHH). 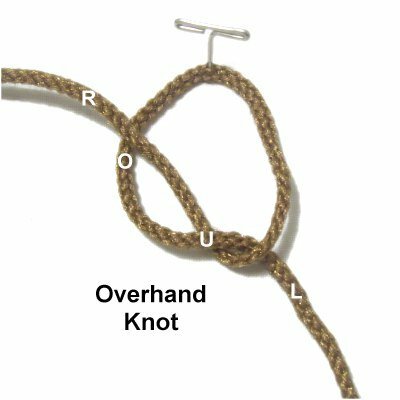 Make sure the Overhand knot rests against the holding cord when you are through. Step 5: Repeat steps 1 - 4 if you wish to practice mounting additional cords. Description: The Venetian Picot Mount can be made with more than one knot. 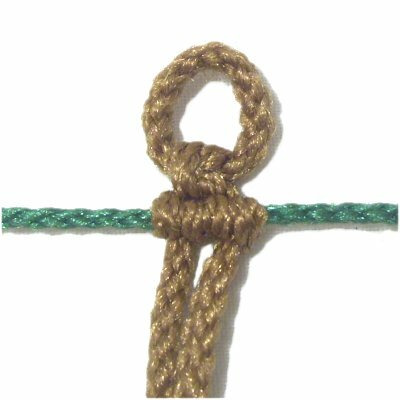 The most common technique is this Triple Knot design. The advantage to using this variation is that the picot will be larger and more visible. This design is more suitable for 2mm to 3mm material. The most important part is to make sure the three knots are close together without any extra space between them. Preparation: To practice, you need one working cord and one holding cord. Make sure the working cord is at least 18 inches long. Step 1: Repeat steps 1 and 2 from the basic design, to make the first Overhand knot at the center of the working cord. 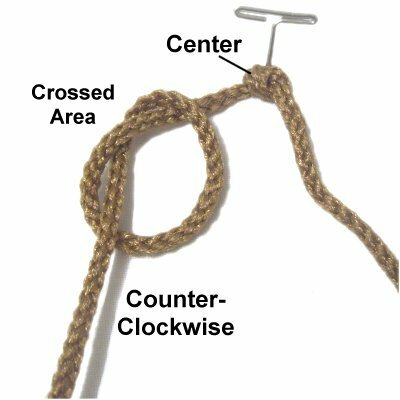 Use the left half of the cord to make another Overhand knot, rotating counter-clockwise. The crossed area should be on the left. Step 2: Tighten the knot gradually, pushing it towards the knot at the center. 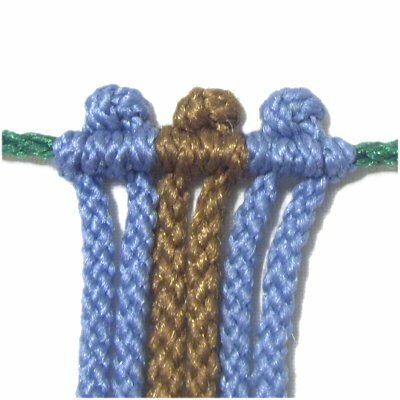 When you finish, the two knots should be TOUCHING, with little or no space between them. Step 3: Use the right half of the cord to make the third Overhand knot. Rotate clockwise, so the crossed area is on the right. 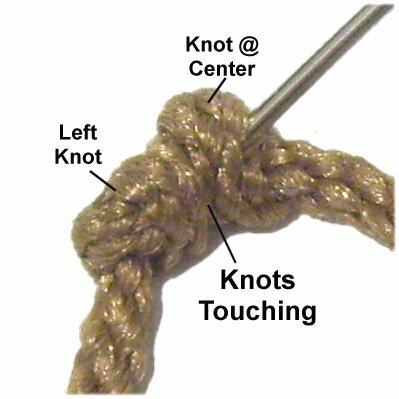 Tighten gradually, so that when you finish, this knot will be touching the one at the center. Step 4: Arrange the holding cord horizontally. Place the triple knot design next to it with the cords underneath. 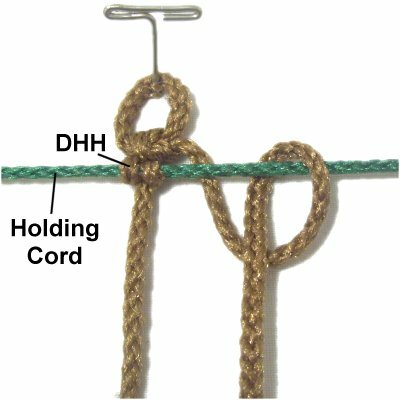 Attach both halves of the working cord to the holding cord with DHH. 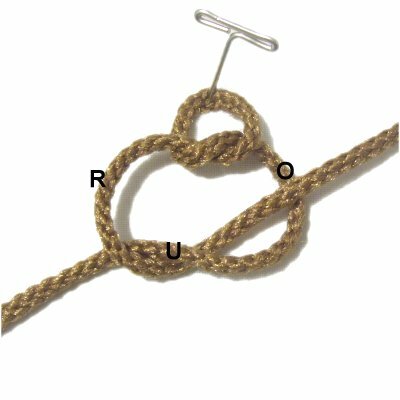 Make sure knots 2 and 3 are touching the holding cord when you are finished (no gap). Description: This variation of the Venetian Picot Mount has a loop above the knot, which can be any size. In general, the loop should be no more than 1-inch tall, but that really depends on what you are making. Preparation: To practice, you need one working cord and one holding cord, at least 15 inches long. Step 1: Tie an Overhand knot at the center of the cord. Make sure you cross right over left, then bring the right half through the loop. Do not completely tighten the knot. Adjust the size instead, and secure it to your board. 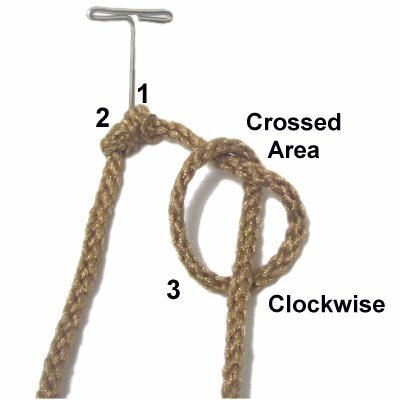 Step 2: Start another Overhand knot, crossing right over left. Keep in mind that the two halves have switched places, so the right half is now on the left. 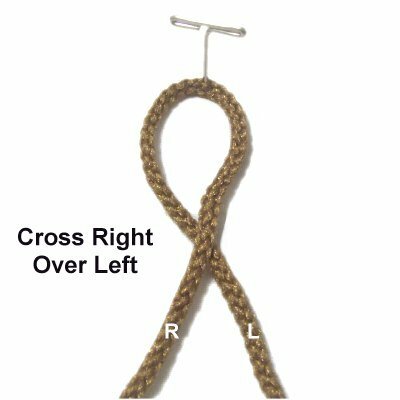 Step 3: Pass the right half under - over the left half to complete the Overhand knot. 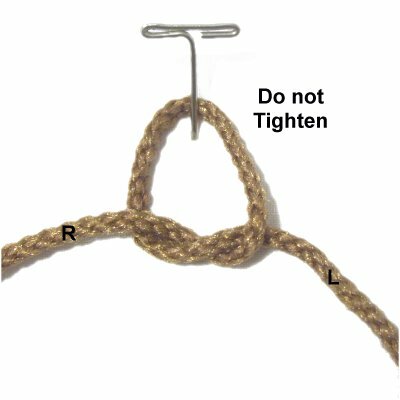 Tighten this knot completely, without altering the first knot. Step 4: Arrange the holding cord horizontally. Place the knot and loop next to it with the cords underneath. 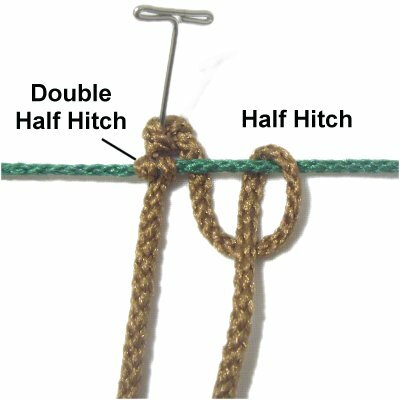 To complete this variation of the Venetian Picot Mount, attach both halves of the working cord to the holding cord with DHH. Have any comments about the Venetian Picot Mount? Contact Me.